Dorrit Black was a key figure in the development of modernist aesthetics in Australia during the interwar decades. Born in Adelaide, she studied in Sydney in 1915 under Julian Ashton and Elioth Gruner and during the 1920s increasingly focused on 'modernising' her practice. In 1927 she travelled to Europe in order to acquire (in her own words) "a definite understanding of the aims and methods of the modern movement and in particular - the cubists". She initially studied linocut printmaking with Claude Flight at the Grosvenor School in London, and then moved to Paris where she enrolled in the Academy of the Salon cubist André Lhote. This abstract still life was produced soon after, around the time Black studied with French artist Albert Gleizes (1881-1953), a painter and writer on cubism. 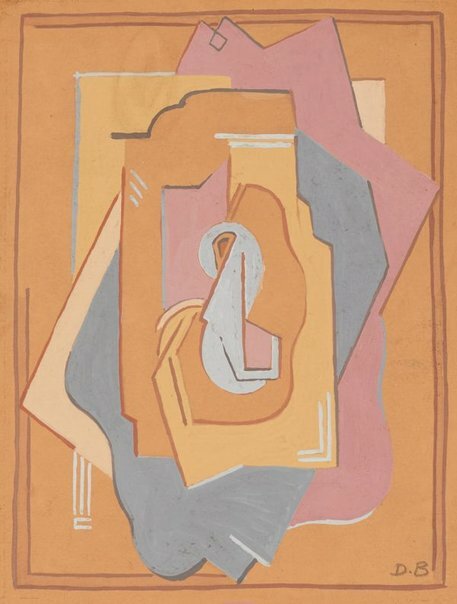 She attended three lessons with Gleizes along with fellow Australian artist Grace Crowley, making a number of drawings and gouaches that extended their understanding of cubism as taught by Lhote, adding an element of dynamic movement to their work. These insights they shared with their friend, potter Anne Dangar, whose work was transformed by Gleize’s theories when she moved permanently to work at his artist colony Moly-Sabata, south of Lyon. Black continued to exhange these studies by post with Dangar in France for comment, after returning to Sydney in the early 1930s. Signed l.r., gouache "D.B". Not Dated.